Monochrome: Pioneer with Adjustable Nose Pads 03 features extra black lenses in a matte black acetate frame. Titanium side inlays complete your monochrome look. It all started here, but adjustable: The classic Westward Leaning sunglass, Pioneer was our debut style and now it is available with a adjustable nose pads. We set out to create the perfect wayfarer using only the finest materials and best craftsmanship. Each frame is meticulously handmade in Japan and features high-quality shatterproof lenses with 100% UV protection. The Adjustable Pioneer shape was designed with premium non-slip silicone nose pads. Perfect for individuals with low nose bridges, for whom traditional wayfarers often sit on their cheeks. Its super-durable construction and smooth, high-quality hinges ensure these will be your favorite shades for years to come. 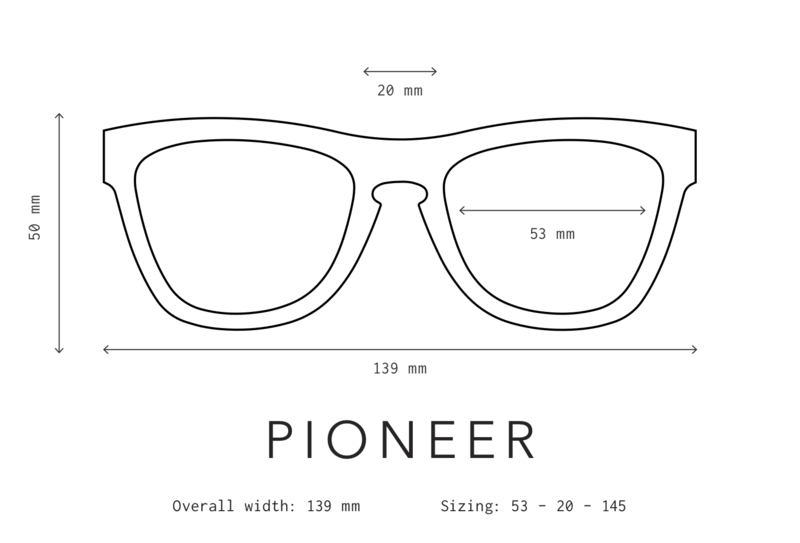 Design the Adjustable Pioneer to fit your style!